jalebi recipe | instant jalebi recipe | homemade crispy jalebi recipe with detailed photo and video recipe. basically, jalebi is prepared with a fermented jalebi batter, however, this recipe is instant version of jalebi. 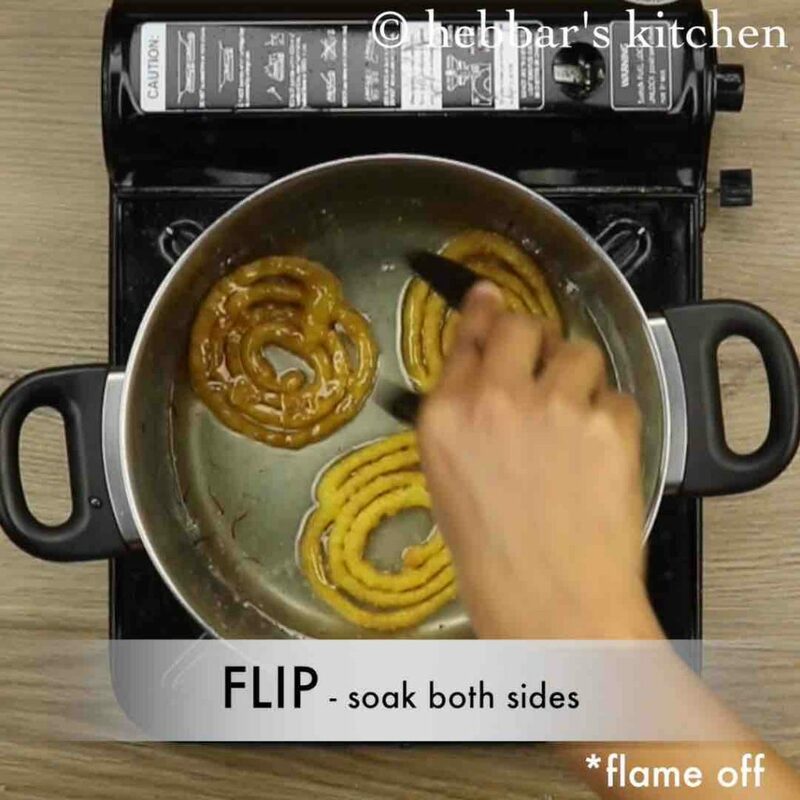 instant jalebi recipe | homemade crispy jalebi recipe with step by step photo and video recipe. jalebi come under top 10 popular sweet from the indian cuisine. 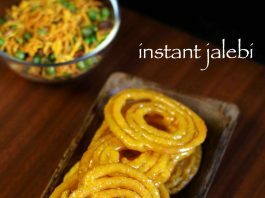 you might have never heard of instant jalebis, but is possible. jalebis was born in the north and has become famous all over india. 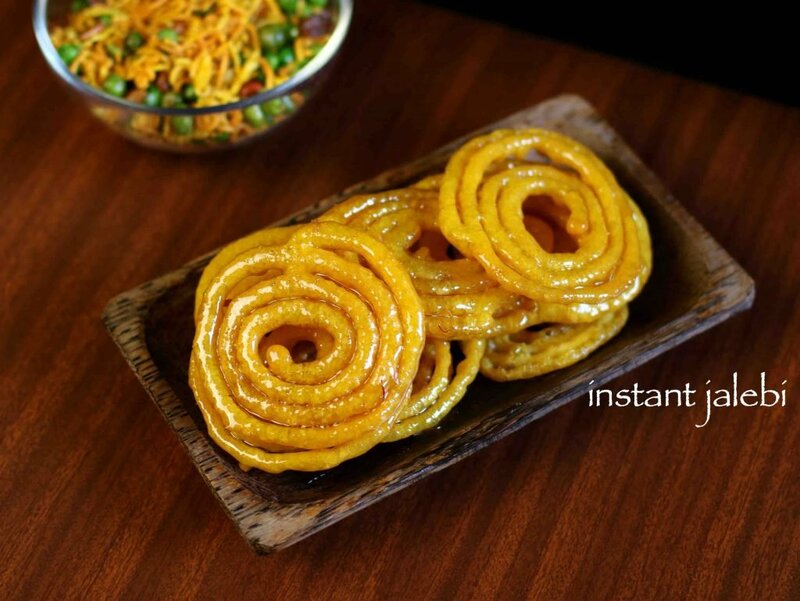 the jalebis are sweets having crispy, chewy texture with a crystallized sugary coating. bengalis usually enjoy these juicy jalebis hot in their daily breakfast. you can enjoy this hot or cold as a dessert. jalebis are popularly served during ramadan and diwali. 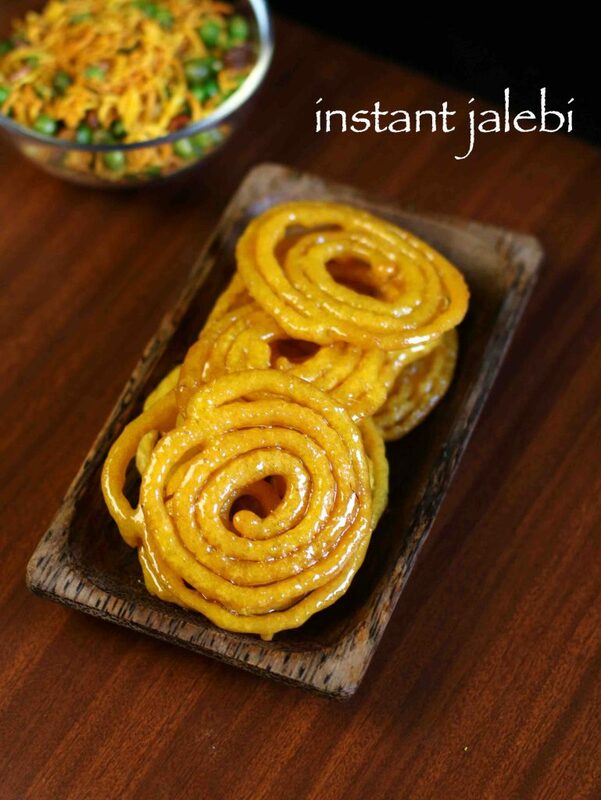 to get are crispy, sugary, tasty, juicy and crunchy jalebis is not difficult but need a trick. traditionally to make jalebis it was a long process. i remember in my marriage, how the jalebis were made. firstly, the batter was allowed to well ferment. and the next day batter is poured into the cone made with cloth and round spirals are made in hot oil and deep fried. later jalebis are soaked in sugar syrup for a few minutes and then served. in a mixing bowl, mix maida, corn flour, curd. then add half tsp vinegar and water. mix well in round circular directions for 4 minutes. now add baking soda and give a gentle mix. now pour this batter in the tomato ketchup bottles carefully. 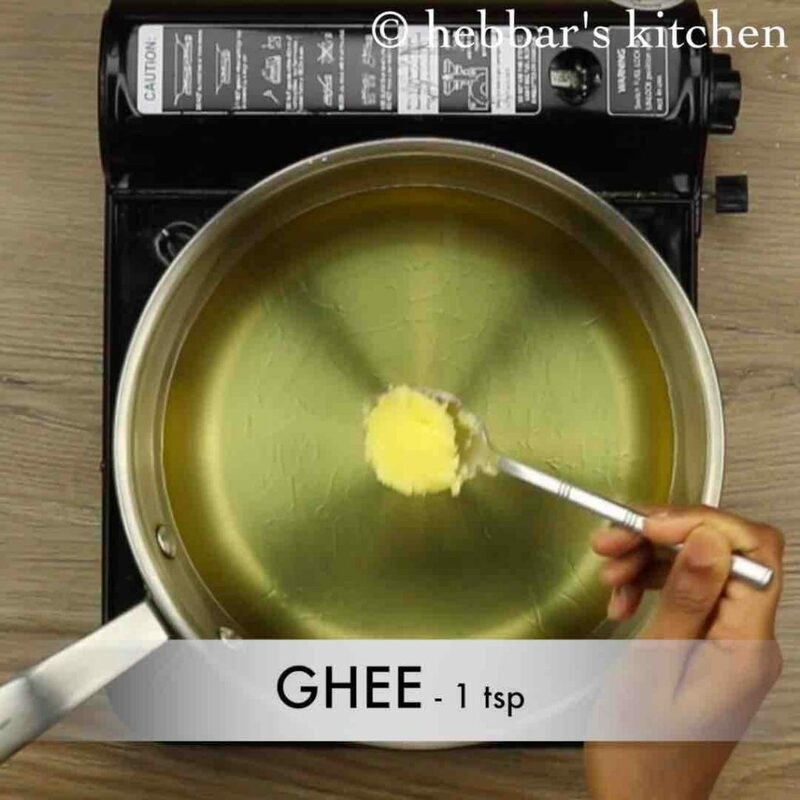 heat oil in a pan and add 1 tbsp of ghee. 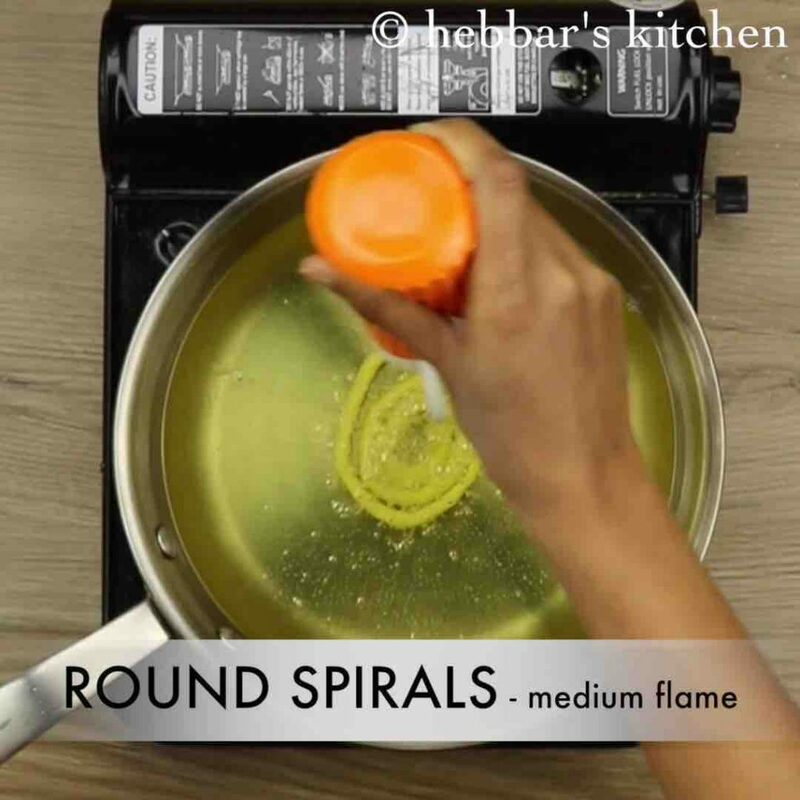 squeeze the bottle and make round spirals with the batter. when one side is partly cooked, turn over and fry the other side. fry till the jalebis are a light golden. then immediately drop the fried jalebis in the warm sugar syrup for 30 seconds (1 string consistency). 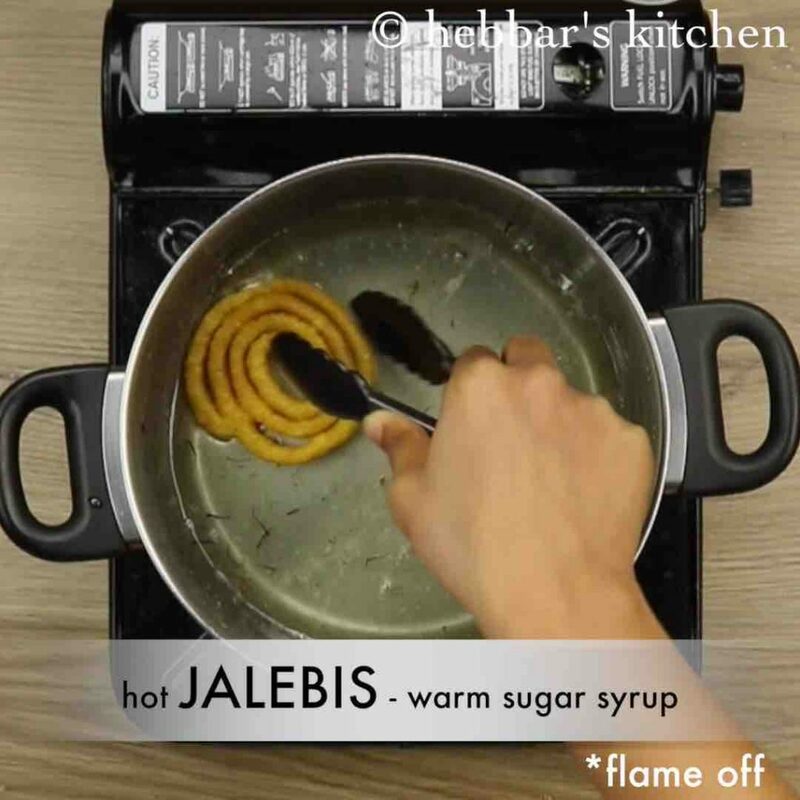 finally, serve jalebis hot, warm or at room temperature. 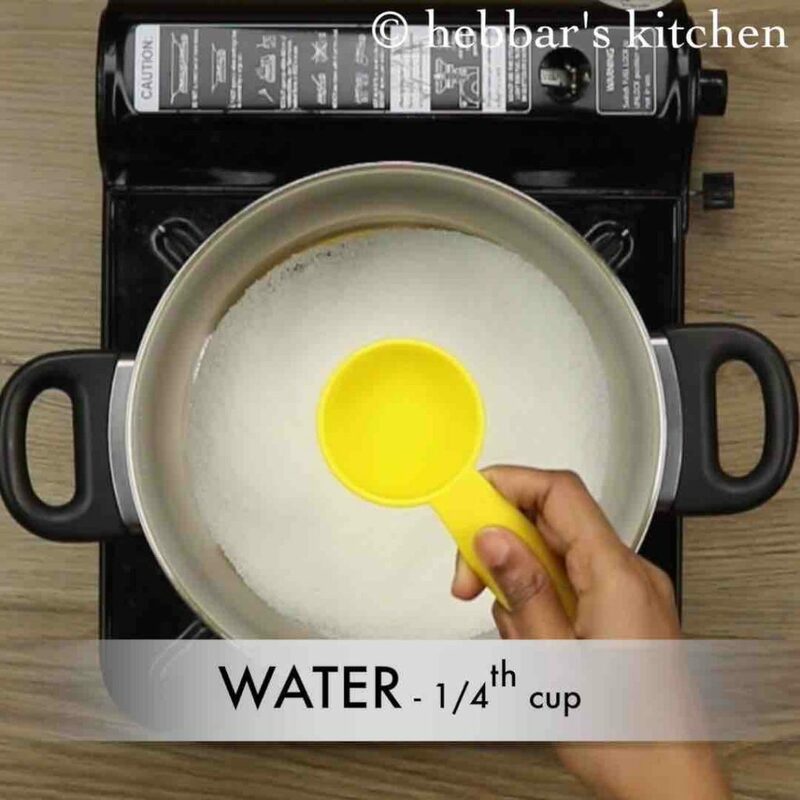 firstly, take 1 cup sugar in a pan and add ¼ cup water. keep stirring on low flame, so that the sugar dissolves. boil the sugar syrup and add saffron. 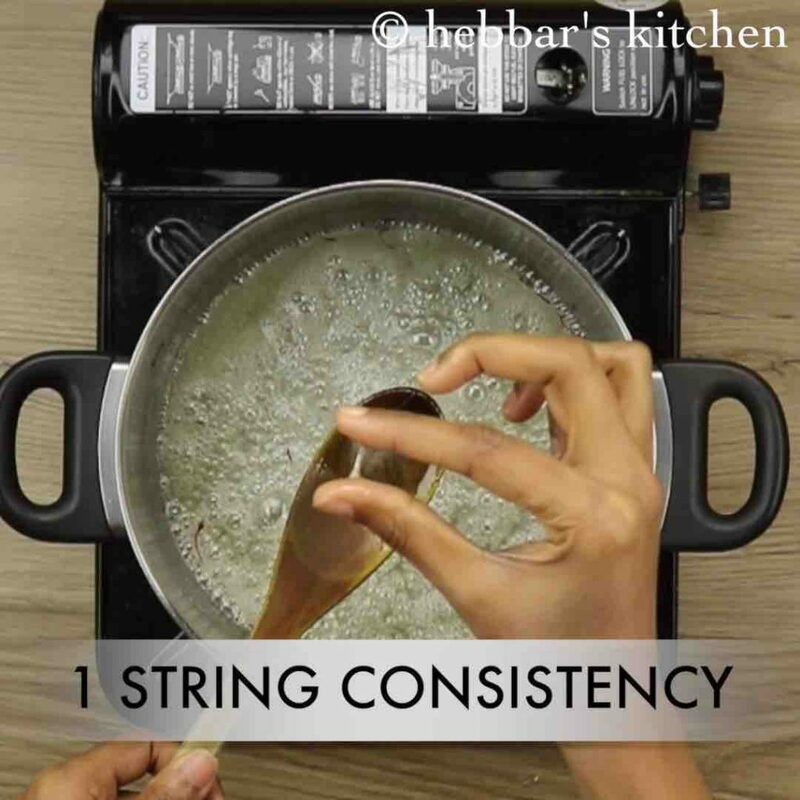 cook till you get one string consistency in the sugar syrup. 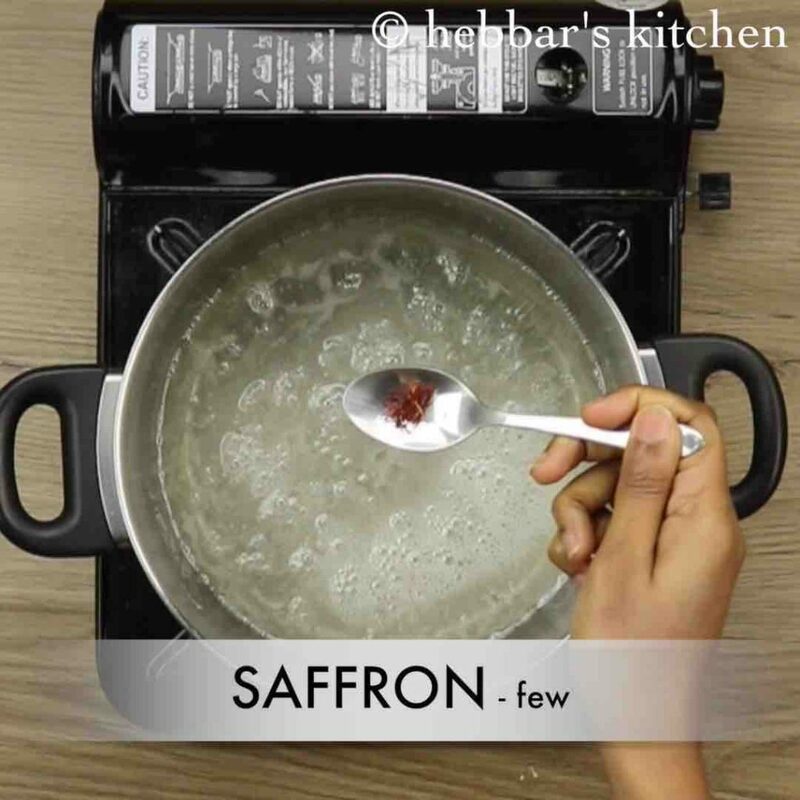 once one string consistency is attained, switch off the flame and add ½ tsp lemon juice and cardamom powder. 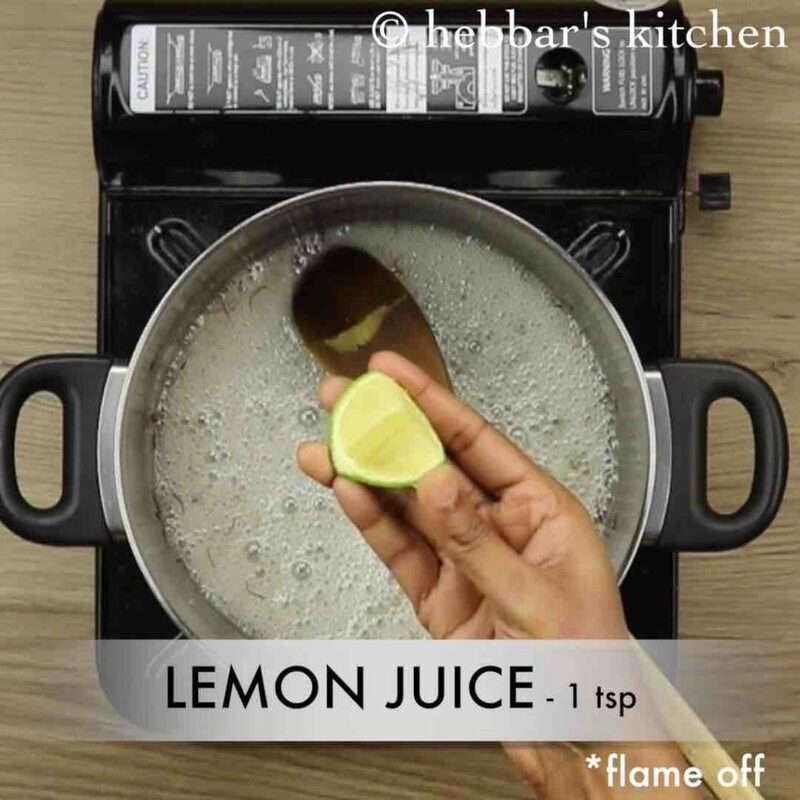 lemon helps to avoid crystallizing sugar syrup and keeps your jalebis crispy. 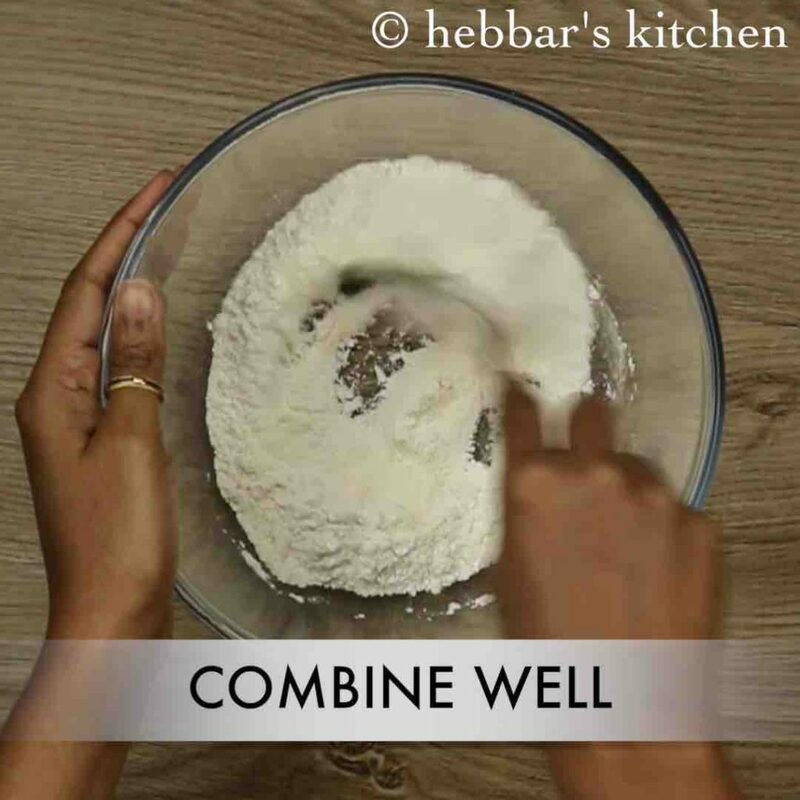 firstly, in a mixing bowl, take ½ cup all purpose flour or maida, 1 tsp corn flour, 1 tsp curd and 1/8th tsp of food colour. mix all the above ingredients with a spoon. 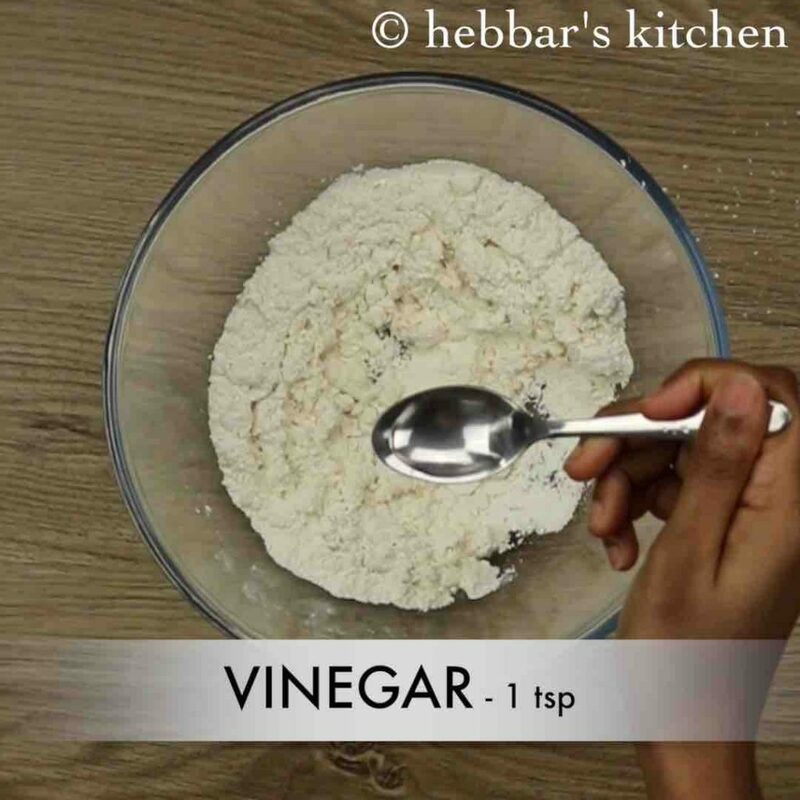 then add half tsp vinegar and 5 – 6 tsp water. the amount of water to be added slowly and as required. 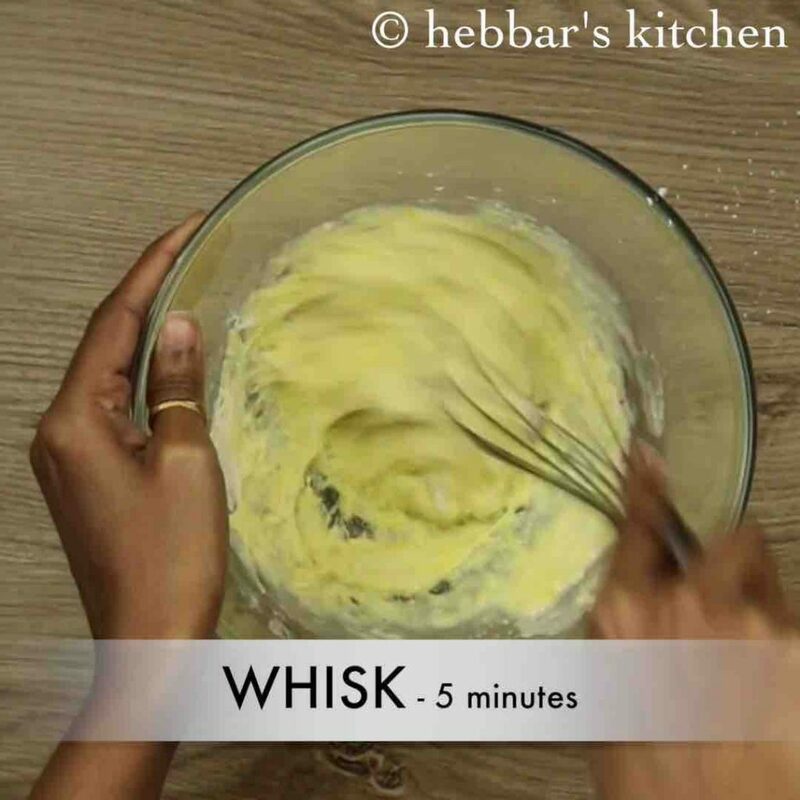 whisk well in round circular directions for 5 minutes. 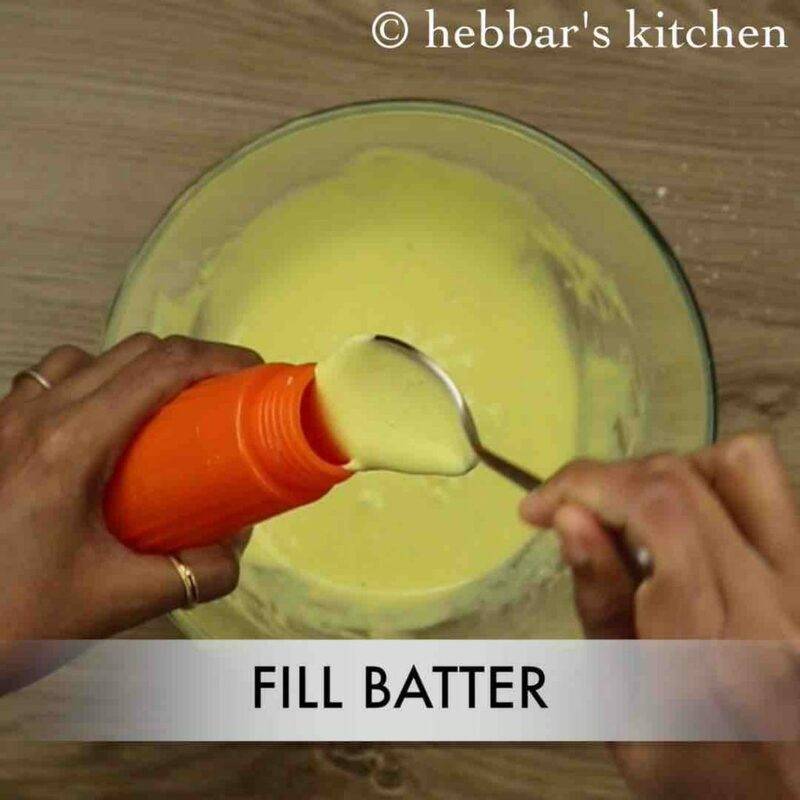 this adds volume to the batter and makes it even and smooth. 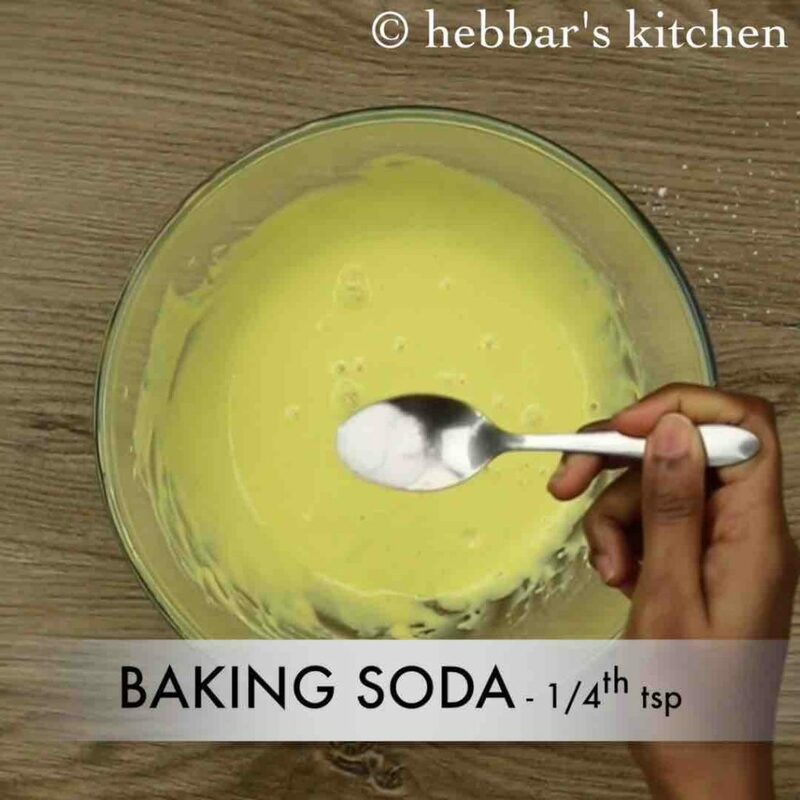 now add ¼ tsp of baking soda and give a gentle mix. further small bubbles appear on the top. 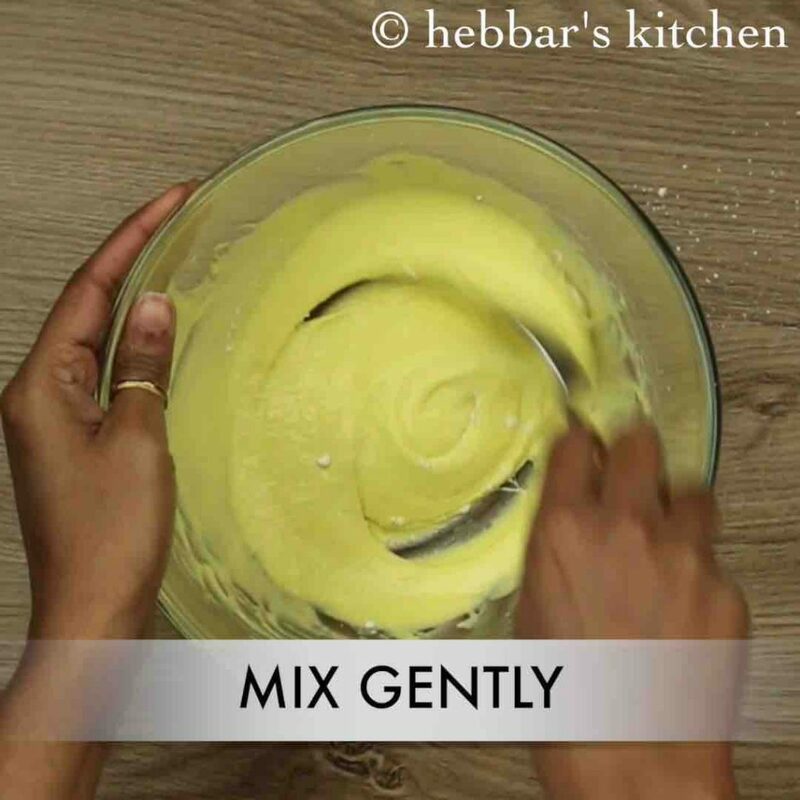 stir the batter lightly and it should have a flowing consistency. firstly, heat oil in a pan and add 1 tbsp of ghee. ghee gives a better flavour. 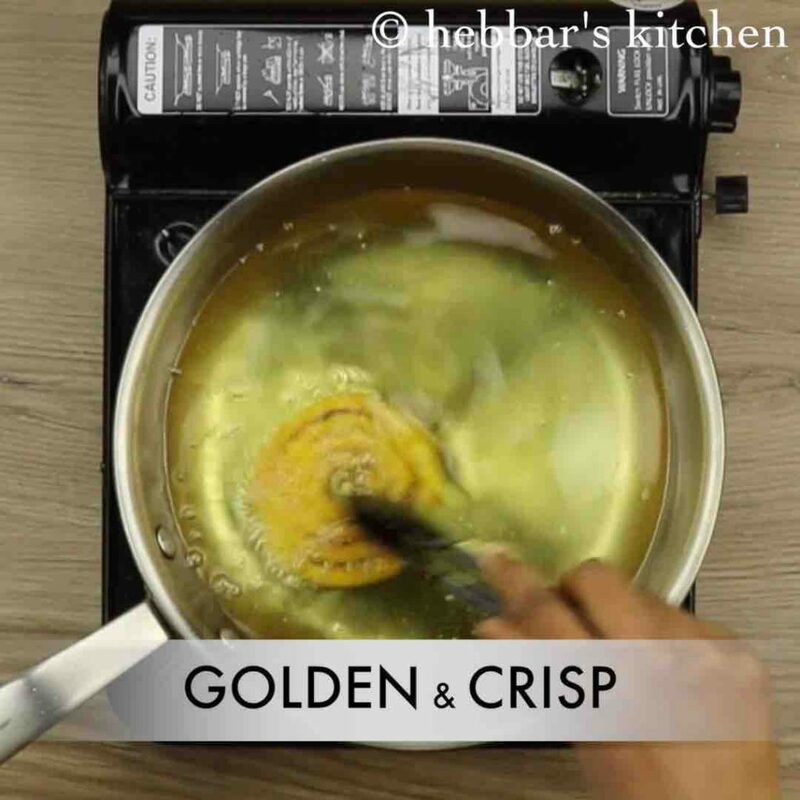 make sure your pan is not too shallow and should be approximately 1 inch deep for frying jalebis. now squeeze the bottle and make round spirals with the batter. furthermore, when one side is partly cooked, turn over and fry the other side. also fry till the jalebis are a light golden. remove with a tongs and shake to drain the extra oil. then immediately drop the fried jalebis in the warm sugar syrup. dip and turn over so that both sides are coated with the syrup. remove and shake lightly and place them in a plate. 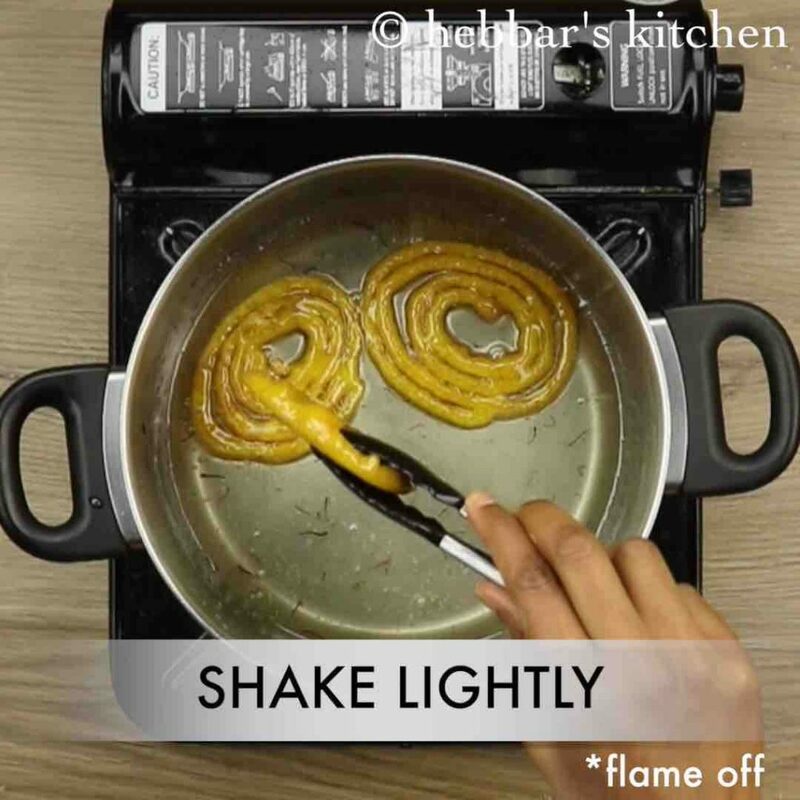 finally, serve jalebi recipe hot, warm or at room temperature. store the leftovers jalebi in an airtight container and refrigerated. 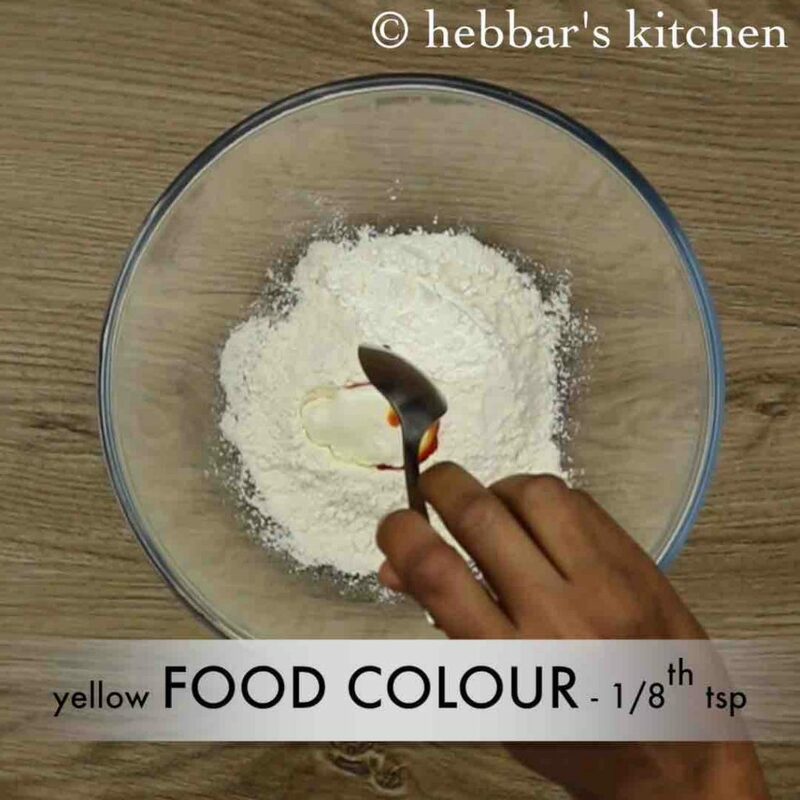 firstly, to get rich yellow colour to your jalebis, add yellow food colour. however it is optional. 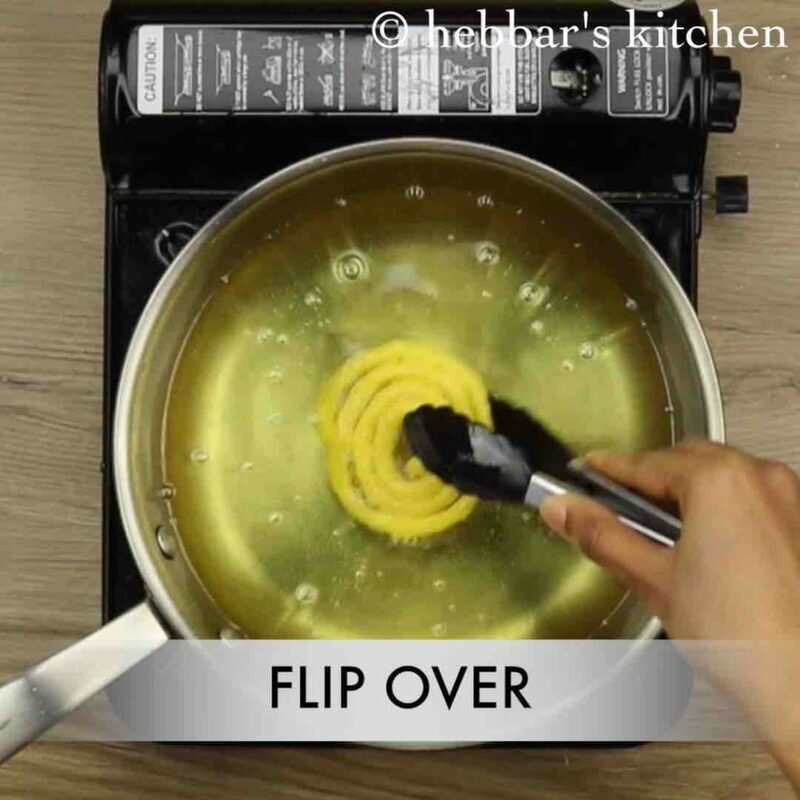 in addition, make sure your pan is not too shallow and should be approximately 1 inch deep for frying jalebis. furthermore, don’t worry if you won’t get perfect shapes in first attempt as the jalebis keep on moving while you make the circles. you need to be quick and this does require some practice. finally, if you like your jalebi recipe too sweety then keep in sugar syrup for about 2 to 3 minutes. Hi. Can I use apple cider vinegar? Thanks for the wonderful recipe. Taste was really good, but I have a doubt after adding lime water also my sugar syrup became crystallized after few hours, wat should I do to avoid crystallizing of sugar syrup??? But once again thanks for the simple and easy recipe. 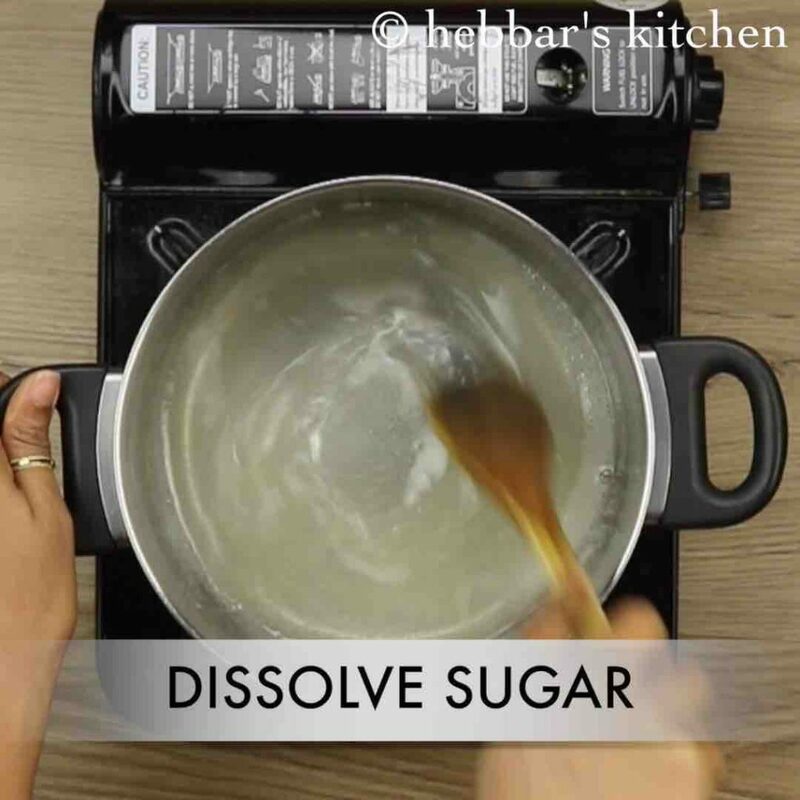 adding lemon juice prevents sugar from crystallising.. I tried your recipe. I tried this in the night it was crispy. But in the morning it turned soggy. Did I miss anything or what should I do to prevent this what should I do to prevent this?? have you added lemon juice? Amazing , simply amazing !!! I am addicted to your videos, tried this recipe it turned out awesome !! Can we use baking powder instead of soda? If yes, what will be the quantity? If we don’t have sauce bottle then what can we use to make Jalebi ? tried it… OMG it came amazing.. thanks..
it gives crispy texture to Jalebi. i guess you added more corn flour. also the sugar syrup should be hot and also jalebis should be hot while dipping it. Can I skip the corn starch? I noticed u add baking sida and bsking powder in some recipes..both works differently?wht are the differences between two?please let me know. Thank you for sharing such an easy and wonderful recipe. Can we use eno instead of baking soda? If so then please mention the amount. can I use left over rasgulla sugar syrup for jalebi? I tried to make, but the batter didn’t turned up in good form,I have added cooking soda and other things required but once I started to fry it became rubbery and inside it was pinkish colour. Please guide me what when wrong. hope none of the ingredients are expired… turning pinkish indicates there is some chemical reaction happing.. suggest you to just check with ingredients… esp baking soda..
corn flour or corn starch???????????? Thank you. I wanted to ask the same. how much lemon juice did you add? I tried it yesterday and it came out really nice…crispy and yummy… my family loved it!!!! Thankyou so much for sharing this easy and quick recipe. thanks a lot for those wonderful comments.